We are all busy folks. So let’s have a fast chat. This is all I need you to know: I made tote bags!!! And…THREE of you will win big! Say what up. Tell me what you want me to bake next. Tell me the name of your cat. Just keep things classy. Comments close tomorrow, February 23rd at 5 p.m. (EST) and THREE winners will be announced by 7 p.m. (EST). More importantly. 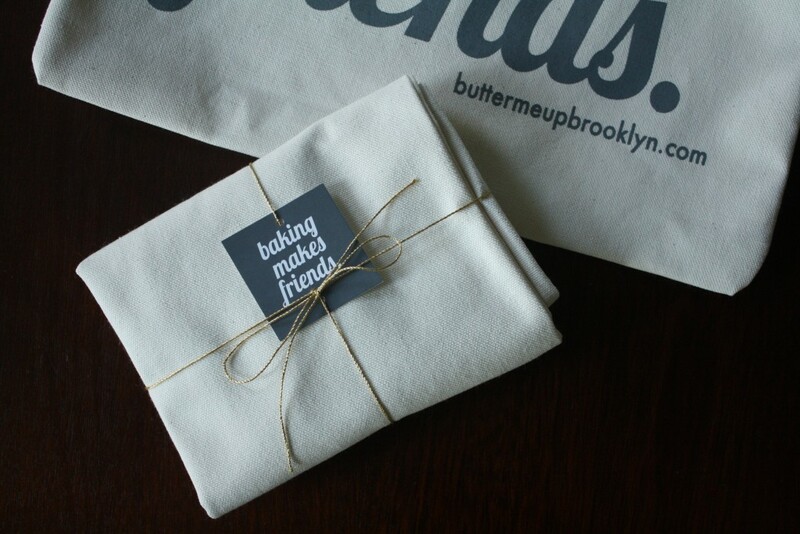 Are you coming to BAKINGMAKESFRIENDS tomorrow? You can get your tote bag on at the event for just $12. What a deal! Nitty gritty. Anyone can enter the giveaway, but the winning shipping addresses must be in the contiguous United States. Have the tote mailed to a friend if you win and live abroad! I want you to get your tote so please leave a valid email address and I will contact the winners to coordinate shipping details. The winners will be randomly selected through blog magic. One entry (comment) per person please. love the blog! would love to see some recipes for breakfast muffins/bars (something that you can pretend is healthy…). thanks! 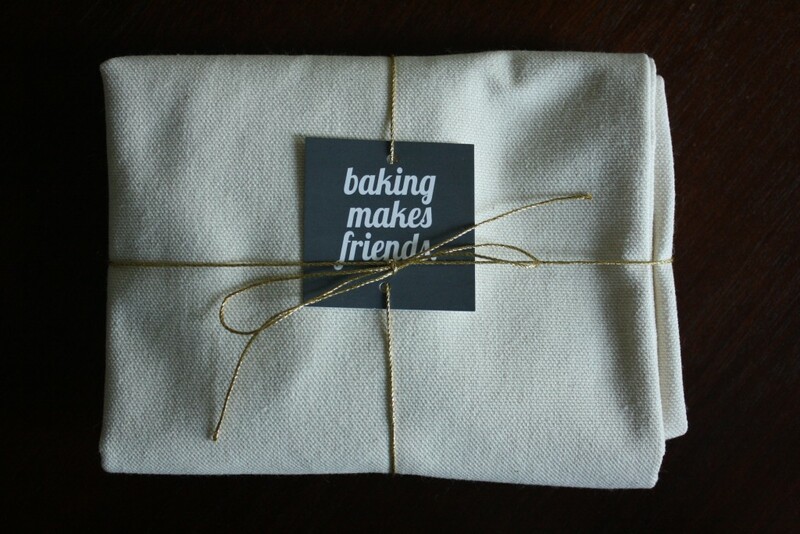 Woohooo, excited for BakingMakesFriends tomorrow! I would love to see some recipes about creative ideas for cookies! Love the totes Lillie! If I don’t win I’ll just steal Josie’s the next time I’m in NYC. I assume she’ll be ok with that. But I’d much prefer that she and I can saunter around Brooklyn with matching totes. We’re more likely to make friends that way. These are fab totes! And they make me want to eat cupcakes!! i. need. this. bag. love it!! Love, love, love the totes!!! I also love the easy to do recipes that even a novice like me can execute!!! Ekk. . . so awesome. But what can a girl do if she doesn’t live in Brooklyn and doesn’t win a tote? Is there a BAKINGMAKESFRIENDS etsy page? If we order three, do they come with a free stick of butter? Thank you for asking Shaara! Yes, they will be available online soon! I’m also trying to figure out the best way to throw in that stick of butter! Ha! One can never have enough tote bags…. I like the bag but I like pie even more. Maybe a pie recipe soon? Blueberry would hit the spot but it’s not in season…. Rhubarb? I desperately need this bag to carry my books, “Weird Ideas” notebook (“sweet corn souffle with white chocolate center”; “soft pretzels filled with peanut butter and jelly”), tools and cake building supplies to and from pastry school. Inevitably it will also be jammed full of snacks, a half empty jar of Biscoff spread, multiple spoons and an assortment of candy wrappers. One can never have too many totes! Perfect for carrying home some lemons for some bread pudding and olive oil cake I plan on baking next. Baking is one of my favorite things to do. Not only is it therapeutic, but it’s also immensely rewarding to see something you’ve created with your hands (and sometimes, sweat) come to fruition! I’d love to see a post on how you manage to cook in your NYC-sized kitchen. I find that I bake more now that I have more than .5 sq yds of counter space. We are putting in a chicken coop, and with an excess supply of eggs on the way, I’d love some more quiche recipes! The tote is adorable – love it! I *need* this tote. I promise to carry some snacks, but I have to admit it will most likely be filled with books I need to read (while wishing I had some BMUB snacks to enjoy simultaneously…). It looks gorgeous and I can’t wait to make new friends whilst carrying it around Seattle! My animal’s names in the past and present have been/are: Cucumber, Zucchini, Spam, and Naartjie (tangerine). Challenge: Include at least TWO of these in a new baked good. If the people love it, I’ll take a tote. 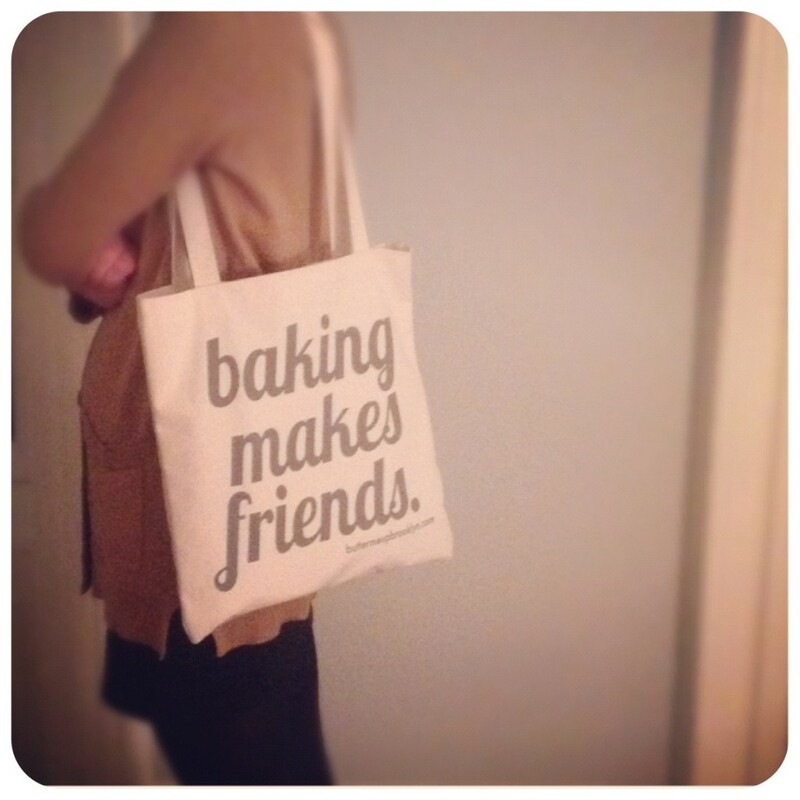 And the totes are super, btw! Lil – these are incredible. I need to get my hands on one! i can’t make it tomorrow, but keep letting us know about your events with some more lead time – i live in the neighborhood and would love to come. I need one of these – I will give it to my friend who will be so excited because it fits her to a T!! and then when they go on sale I will buy one for myself because I LOVE IT!! So well done. oooooh… now I want to go bake! I love that bag! And I’d love to have one! Yayayayayay! All my totes are getting grimy, so I def need a new one! As for baking ideas, are you allowed to include baked goods made for getting baked? I know, i know, keep it classy, so that’a all i’ll say. But ALSO how about something hot and chocolaty that you pour liquor over. . . These are awesome!! I cannot wait to buy one when they’re ready to be sold!! You know my kitties well: Lucy and Leo!! I think you should make some cream cheese brownies – extra moist and chocolately! YUM! This bag is adorable!! Cute website! I love it! We spread vegan awareness and advocacy through vegan cupcakes and make friends that way! SUPER CUTE!!! I wish I was still in Brooklyn to go to the event tomorrow!! Have so much fun! This is the cuttest tote ever! Would love to trade my old TJ’s tote for this one! Ooh la la..Too darn loveable and wearable! !I can hardly wait to win or buy one, ok? Haven’t been baking much, but rhubarb season is near..and then, it must be done!! Love following BMUB…xxoo Beautiful recipes and photos..Thanks, sweetie. Ooookkk, Lillie- here’s the deal. That’s a cute bag. Secondly, I made these today: http://whatsgabycooking.com/slutty-brownies/ and baking truly makes friends because I’m sending all but the 2 Mike and I ate just now to work with him! As long as he doesn’t keep them in his drawer at work for himself, I better make some friends with them. I miss our craft nights with your mom. Candle making, basket weaving, the magnificent Cupcake disappearing act video! BMUB – ooh, la, la. With butter and cayenne and chocolate how can you go wrong? 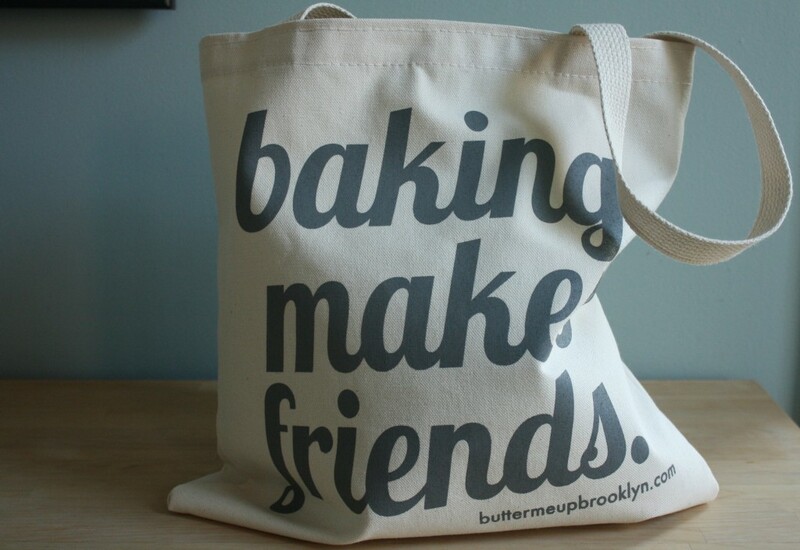 oh my goodness – I love this bag, but I would absolutely give it to my friend who is a hard-core baker. This would be such a wonderful gift for her! Thanks!! Cute, cute, cute totes! Love the pics, too! I love this bag! I’m headed to make some brown butter chocolate bread pudding! I’ve been candying citrus like mad, making chocolate beet cakes with candied citrus on the bottom. And, anxiously waiting the BMF event! See you tonight! Me me me! I don’t have enough Lillie in my life, carrying this bag will maybe begin to make up for that! 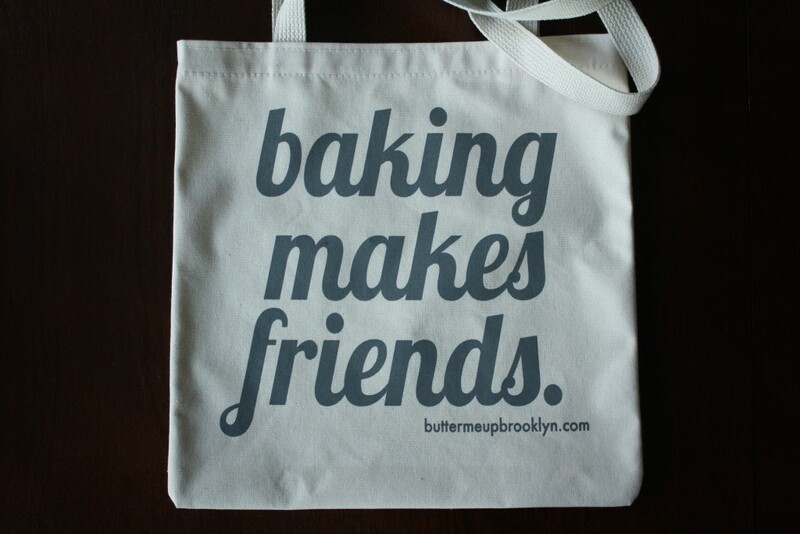 Baking really does make friends! Now that I work at Butterlane in the east village, I make friends with customers all the time! Loved your Brooklyn Brainery class! We’re almost through our first of brown sugar simple syrup! More bourbon drink ideas are always welcome! There is truth written all over that bag. How about some more frozen desserts? Maybe some that involve boozy fruit? I would really like to get one of these bags. Do you have anymore for purchase? i want one! soooo adorable!